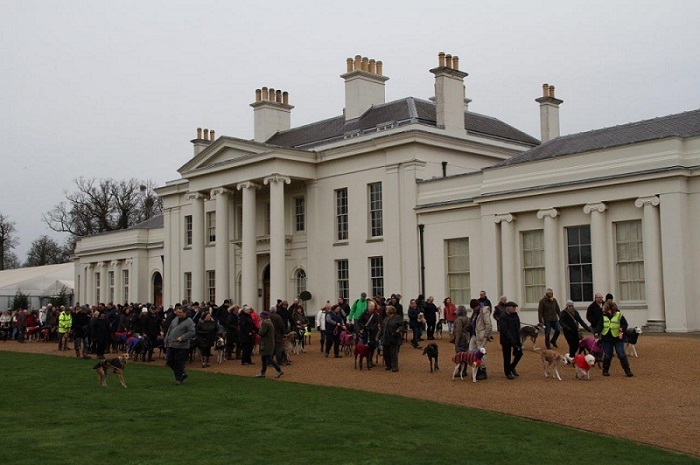 We’d like to say a great big thank you to the 197 sighthounds (and their 13 non-sighthound siblings) who brought their humans to our New Years Day Greyhound Walk at Hylands Park yesterday. It’s always wonderful to see so many happy hounds and happy owners, and meet up with friends old and new. In spite of the recent rain, from the ankles up everyone stayed dry. And, after the walk, hundreds of cups of tea, coffee and squash were served up by our super volunteers, whilst hundreds of cakes and biscuits were devoured by humans and hounds alike. Overall, the feedback we have had has been fantastic. Many people told us that they now consider our walk to be the only way to mark the New Year. And one person went so far as to declare it ‘legendary’! However, we are aware that a few of you were less than happy about the lack of adequate parking. Despite us paying over £200 to Chelmsford Borough Council for the privilege of holding our event at the park we have no control over the parking availability. Yesterday was as busy, if not busier than ever. So to those who struggled to park we apologise, but we hope you understand it’s out of our hands. We will of course feedback all your comments to the powers that be. For lots more pictures of the day, visit the event page on Facebook.